The Smoke Eaters started the game with plenty of pressure on the Vees net, opening the game with a 7-2 shot advantage in the first 12 minutes of the game and finished the period leading by an 11-7 margin in the shots on goal category but the game remained scoreless through 20 minutes with each netminder in Adam Marcoux and Jack LaFontaine remaining perfect through one period. The Vees came out in the second period and changed the narrative of the game, holding the Smoke Eaters to just one shot in the period and collecting three goals, beginning with an Andre Ghantous marker at the 6:06 mark of the middle stanza. Ghantous worked his way down the right-wing side and placed a perfect shot over the glove of Marcoux to give the Vees a 1-0 lead. 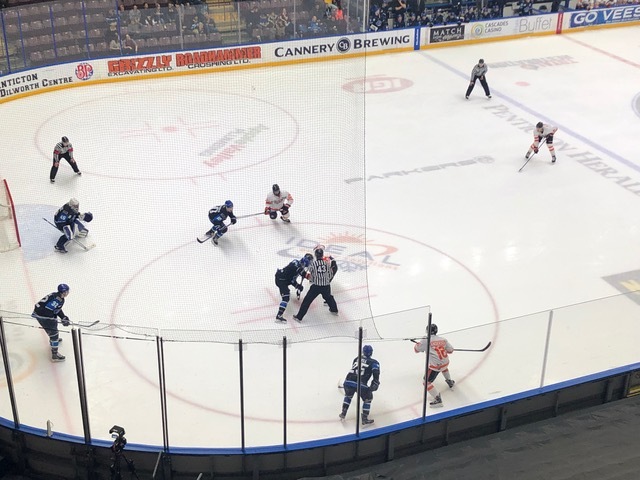 Jackson Niedermayer extended the Vees advantage to 2-0 just over two minutes later at the 8:07 mark of the period on a rebound. James Miller tried a shot from a sharp angle that careened off the right pad of Marcoux with Niedermayer finding the back of the net to push the Vees advantage to a pair of goals. Penticton continued to apply pressure as the period wore on and pushed their lead to three goals at the 19:16 mark and came down a skater while shorthanded. Miller placed a perfect pass from his own zone on the right side to Eric Linell who moved into the right side and fired a slap shot past the blocker side of Marcoux to give the Vees a 3-0 lead into the 3rd period of play. A five-minute major power play put the Smoke Eaters on the man advantage and Carter Jones got Trail on the scoreboard at the 4:23 mark of the 3rd period. Kent Johnson sent a pass to the left face-off circle for Jones as he lifted a wrist shot over the blocker side of LaFontaine for his 10th goal of the season and cutting the deficit to 3-1. The Smoke Eaters continued to press in the final frame, outshooting the Vees 13-4 in the period including a four-minute double minor power play that went unsuccessful but close the gap to one goal late in the game at the 19:01 mark with the goalie pulled. Jack LaFontaine came out of the net to play the puck, attempting to go for the empty net before Hayden Rowan knocked down the attempt and caught LaFontaine out of the goal for his 11th marker of the season and made it a 3-2 game late in the contest but the Vees would hang on for a one-goal victory. Adam Marcoux turned aside 18 of the 21 shots he faced in his 15th loss of the season while Jack LaFontaine stopped 23 of the 25 shots thrown his way for his 15th victory of the season. The Smoke Eaters (11-15-4-2) head out on the beginning of a three-game Mainland Division road swing, kicking off the weekend of play at the Poirier Sports and Leisure Centre against the Coquitlam Express (0-0-0-0) on Friday night. Puck drop is slated for 7:00 PM with the pre-game show at 6:50 PM on mixlr.com/trail-smoke-eaters as well as HockeyTV.com with the Voice of the Smoke Eaters, Trevor Miller.